Surprisingly, the media focus today is on weddings exclusively. So many reality shows center on the occasion. Obviously, weddings are beautiful, and every bride takes my breath away as beautiful, happy and luminescent as she is on her wedding day! But, there are so many other reasons to plan an event. In fact, there are far too many special occasions worth celebrating to focus on just one. For the last twenty-seven years I have created innumerable special events, both personal as well as corporate. The truth is there is no shortage of varying occasions for which to plan a special event; plenty of them requiring no less of a budget. One of the most popular event planning occasions is the teenage milestone: Bar/Bat Mitzvah. For those unfamiliar with the occasion, it is the rite of passage from early adolescence to Jewish adulthood where a Rabbi ceremoniously “confirms” a child into adulthood followed by a celebratory reception. The name is composed of two Hebrew words. The first word, Bar/Bat literally translates to son/daughter. Therefore, the event name will depend on its participant; a boy would have a Bar Mitzvah, while a girl would celebrate a Bat Mitzvah. The celebration is great fun, especially for the young adults. The second word is Mitzvah which in literal translation means commandment, though the Hebrew word has a much broader meaning. The connotation suggests the elation of doing something for the sake of others and tradition. The carefully planned reception commences after the ceremony and in this respect a Bar/Bar Mitzvah mirrors a Wedding, but this is where the similarity ends. The majority (95%) of Bar/Bat parties are themed. I’ve actually created a form I ask every young adult to fill out on his/her own. The answers will reveal likes and dislikes in food, entertainment, games, music and so forth. 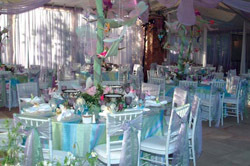 I am then better prepared to create a one-of-a-kind event theme that is special for that particular child/family. The Bar/Bat Mitzvah party demands much creativity and effort from every vendor involved: Event planner, centerpiece/décor/florist/production company, and video and photographers. The reason? It demands much more creativity, because every boy is interested in sports and every girl with modeling, but both love movies, glamour, Hollywood, the Emmy. Since Allen loves Theme Parks, his theme was all about attractions and roller coasters. As you can see in the picture below, the children’s tables were actually constructed like a roller coaster car. Look at the colors and amazing décor. Vince Hart from Kehoe Designs, an amazing designer, built and created amazing décor for Allen. A child’s birthday is always an occasion worthy of a grand celebration and a baby’s 1st birthday is considered one of the most momentous! The themes are centered on every parent’s vision for their baby. Themes I’ve designed have included the Lion King, Garden settings and everything Disney and so on. Young children’s birthday parties are some of my favorites. Mostly common amongst European immigrants, even the second and third generations, the first Birthday of a child, either a girl or a boy, is thought to be one of the greatest reasons to celebrate. Typically, for this event I use a lot of soft, stuffed animals, dolls, butterfly’s, rocking chairs and so on; the cuter the better with pastel colors like white, yellow, pink, powder blue and so on as is in the picture above. Adult birthday parties are obviously quite important and popular as well. I don’t know anyone who wouldn’t like to celebrate their 16th, 21st, 30th, 40th or 50th Birthday. Yes, the 50th Birthday is quite the milestone! Family or friend, when you or someone close to you has lived to see the world evolve over half a century…well I think that’s well worth planning a party, don’t you? Judging by my schedule, most would definitely agree. We’ve spent these years working hard to accomplish so much. Now is the time to share those achievements with those who’ve been there through thick and thin. This past year I have had the honor to create two such special events which are really dear to me. One celebration I planned an event at the Peninsula Hotel for a very successful and extraordinarily talented man. His wife came to me with the idea for a surprise Birthday Party. The entire time we were working together, surprisingly enough, the party remained shrouded in complete secrecy from the guest of honor. Moreover, the invitations even included a note warning all the attendees to keep silent, enhancing the anticipation of the surprise event. Since the honored guest’s hobby is painting, specifically abstracts, I created invitations using ten of his paintings and called it the GF Gallery Opening; GF being his initials which mark every one of his paintings. His exact signature was replicated on every invitation and even the “Man of the hour” himself received an invitation to the “Gallery Opening.” And the piéce de resistance… our décor designer reproduced six of his paintings which we hung in the lobby just outside of the event room as conversation pieces for the guests to enjoy while sipping on pre-party cocktails. He was quite astounded and touched when one hundred of his closest friends and family, some flown in from all over the world, shouted “Surprise.” I will never forget the moment it was all revealed as he gently kissed his wife’s hand with tears in his eyes, a gesture of love and appreciation for the enormous effort and money from her own business she spent to make the event a reality. The partygoers swam in warmth and friendship the entire event. Guests had such a terrific time; they remained to celebrate well into the night. This was a party worthy of a king. The second 50th Birthday celebration I had the fortune of creating, was for a gentleman who is an avid enthusiast of flying. He, on the other hand, was very much involved in the planning aided by his beautiful and wildly creative wife. 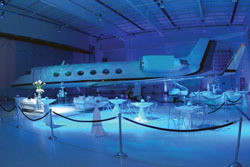 He was thoroughly enamored of the idea of using a private 26,000 square foot airplane hangar for the event. As one would assume, this would be no easy feat by any stretch of the imagination. I must admit, we virtually moved mountains to make this vast, empty space, a.k.a airplane “garage,” available for this event. I was allowed approximately 72 hours for the set-up, celebration and break down. This included returning the hangar in pristine, pre-party condition for its primary purpose. To be on one’s feet that long, running on 2-3 hours of sleep, you really have to love what you do! The true battle, however, was much more involved: to decorate and create a beautiful setting for an amazing, once-in-a-lifetime, one-of-a-kind event in a space that was cold and altogether uninviting. Frost Lighting, one of its owners, David Kelly, along with his team of forty lighting magicians created the effect of a blue sky experienced only when flying at night. Tables and seating were created by owner/ designer, Patrick Pease of Pease Custom Acrylic Furnishings. My poor staff was falling asleep after the first 24 hours. In the end it was all worth it. The food and presentation by Mirage Catering was out of this world! The effort put in by everyone involved really paid off when the guests entered this magical world created out of an empty airplane hangar. The wondrous expression gracing the face of each person as they laid eyes on this setting was a priceless reward for all those sleepless hours and the seemingly endless workload! “Be my Valentine” – Yanni Design Studio in conjunction with Design by Larissa – my favorite and very talented singer’s wife’s 30th Birthday and Anniversary party: see attached. Custom made linens from India with attached chinchilla fur as well as chinchilla napkin rings, gorgeous red roses, custom designed centerpieces, amazing entertainment – and one Happy couple! No expense was speared… since it was a surprise for a wife – she felt as queen! 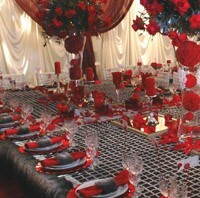 This is what every event is about – to make it memorable and unique for hosts as well as their guest! Job well done. But as descriptive as my words may be, only a picture can showcase the true splendor of an events like that…. Every special occasion, no matter how big or small, is worth celebrating. And why not take a moment out of our busy, everyday lives to share how wonderful it is to take another breath and live another day with those around us whom we love and make it all worthwhile. 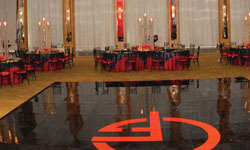 When you’re ready your Event Planner will be there to guide you from dream to reality.